OXFORD, Miss. 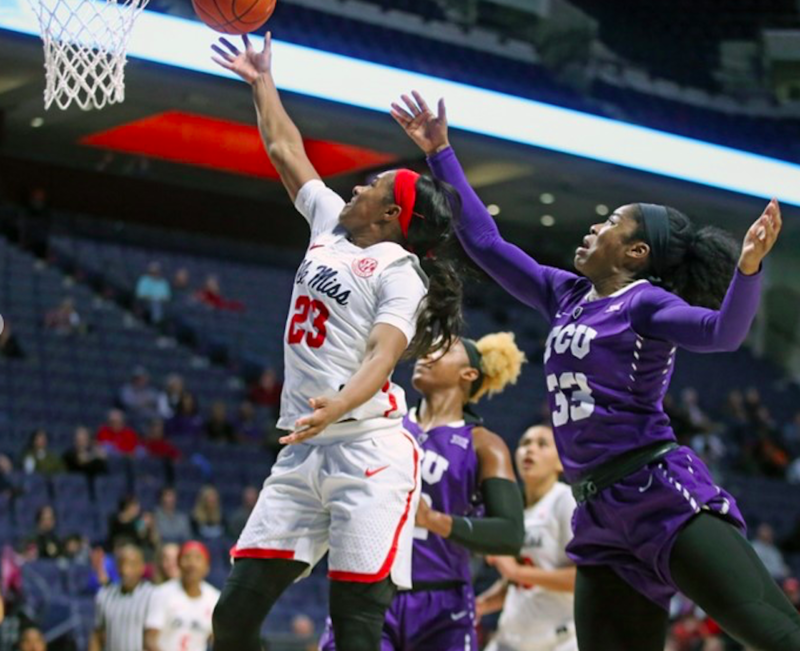 — Beginning a four-game home stand, the Ole Miss women’s basketball team returned to the Pavilion Thursday night to face another strong opponent in the TCU Horned Frogs (4-1). Head coach Yolett McPhee-McCuin’s squad fought hard but fell to TCU, 55-50, in the SEC/Big 12 Challenge. Facing a quality opponent like TCU is nothing new to this year’s Rebel squad who entered tonight’s game coming off a very competitive slate in last weekend’s Paradise Jam tournament. In fact, Ole Miss took on head coach Geno Auriemma’s UConn Huskies in that tournament, a team that has been one of the most prolific sports dynasties of the modern era. They also faced Purdue and St. John’s. Thus far this season, the Ole Miss defense has been able to hold opponents under their total points average in six of seven opportunities. 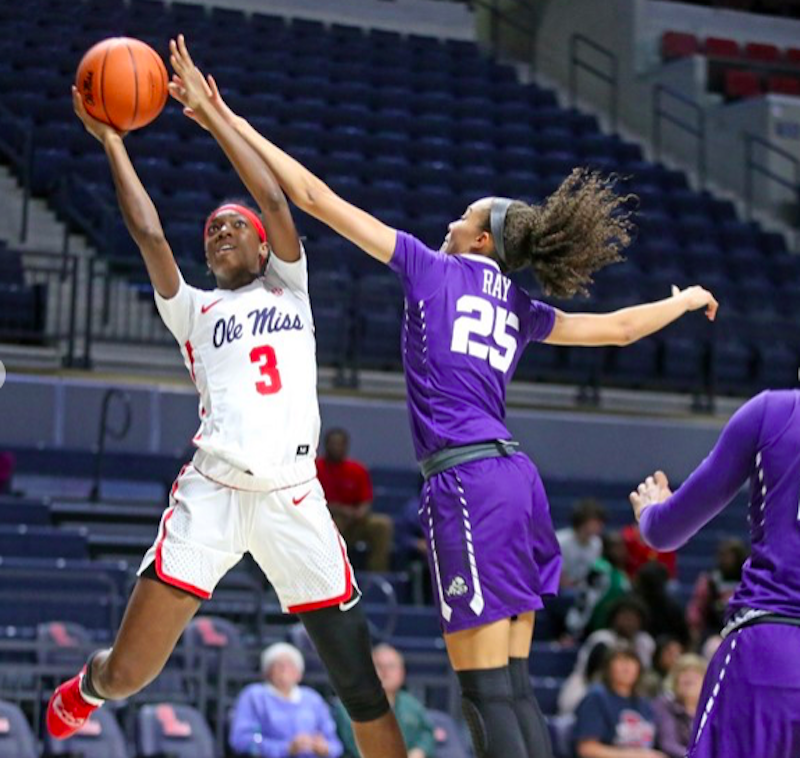 That was the case again Thursday, as the Rebs held the Horned Frogs to 55 points–significantly fewer than the 72.2 points per game TCU was averaging when they entered the contest —evidence of Coach Yo’s dedication to making her team more active and efficient on the defensive side of the court. The Rebels’ head coach continues to stress that establishing the physicality of a team is a major step in building a program, especially in a league as competitive as the SEC. Her team is responding. Tonight, the Rebels were without point guard Mimi Reid, who suffered a concussion yesterday. In her place, Shandricka Sessom stepped in at point. Coach Yo, who noted that she and the team did not find out Mimi would be unable to play until it was almost go-time, discussed the adversity her team has faced. “Tough one tonight, but I’m so proud of our young ladies,” she said after the game. “I’m just telling you, it seems like every time we make a step forward, something happens to challenge us,” she continued. In the first half of the game, Ole Miss had a tough time shooting the ball as the Rebels hit the midway point hitting only 26% from the floor. Over the course of the second half, however, they were able to improve more than 10 percent—and ended up with a higher percentage than TCU, finishing an overall 37% compared to the Horned Frogs’ 35%. 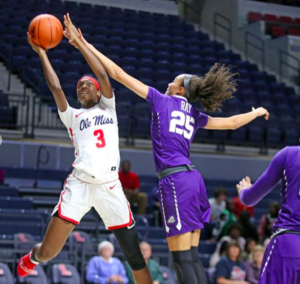 Ole Miss’ Crystal Allen, among others, led a valiant effort in the second half as she and Jhileiya Dunlap combined for 13 total points in the third quarter, as the Rebels went from 14 points down to actually taking the lead by one point at the start of the final quarter. Dunlap finished with 10 points, while Allen notched 8. Coach Yo was not surprised at her team’s resilience. Neither team held more than a two-point lead at any point in the fourth quarter until TCU was able to find its way to the foul line and take a narrow lead through the final buzzer, ultimately defeating Ole Miss, 55-50. While the Rebs experienced some scoring droughts in the game, the difference in the outcome could most notably be felt in the rebounding column. Ole Miss has struggled on the boards and tonight they were outmatched on the boards, 47-32. It may not have been the final result that she wanted, but Shandricka Sessom showed why she is touted as one of the most talented seniors in the SEC. 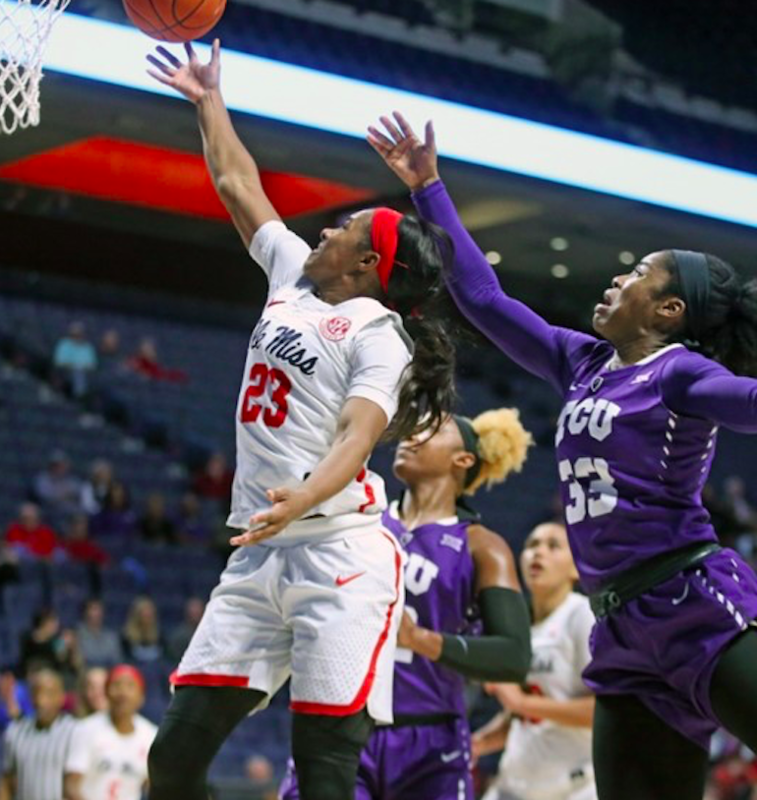 Very early in the contest against TCU, she was able to surpass her points-per-game season average, proving she continues to get better and better after her season-ending ACL tear last year. Against the Horned Frogs, she finished with a season-high 19 points and 7 rebounds. Ole Miss (3-5) continues its four-game home stand this Sunday against Jacksonville State at 2:00 p.m. (CT). The Gamecocks’ (3-3) most recent victory came over Montevallo by a score of 84-52. For those of you in town this weekend, consider going out to support Coach Kermit Davis’ men’s team on Saturday and the women’s team on Sunday. The women’s game features $1 tickets for seats to watch the team continue the Coach Yo era.